The film is based on real events and tells the story of a merchant vessel operating in the Mekong River Delta in 2011 that was attacked by bandits leaving 13 people dead. Chinese authorities teamed up with police forces from Thailand, Laos and Burma to launch an investigation into the incident when a massive stash of drugs was found on board. I’ve been reviewing quite a few films that were “based on true events” recently and this was by far, the most spectacular and heart-stopping film. While most action blockbuster tries to cram too much bombastic action sequences, neglecting the supporting actors (think Operation Chromite? ), Dante Lam managed to balance the character development of the whole team of protagonists and antagonists, as well as the storytelling in this semi-documentary style film. Aside from the team of 8 elite narcotics officers including Captain Gao Gang (Zhang Hanyu) and Golden Triangle-based intelligence officer Fang Xinwu (Eddie Peng), the antagonists consist of 9 Thailand and Burmese drug lords. With such a large team, it won’t be surprising if the attention was scattered or overly-focused on the main leads. However, the director managed to give each character significant attention for the audience to relate to the them when accidents happen. Although many of the antagonists looked rather alike, they were also open referred back to the famous police “relationship chart” to constantly remind us who is who in the film. There are also several long and memorable action sequences to satisfy the adrenaline junkies – the initial chase through a busy market and train station (Impressed with Eddie Peng! ), the shopping mall gun-confrontation (totally put S Storm‘s shopping mall chase scene to shame!) and the finale double attack which awed not just me, but also my friend Peps Goh who happened to be a stunt actor and parkour instructor. “The sequences were well paced and designed in an aggressive almost-brawling manner that had just enough flourish and style to make it dynamic and visually pleasing on screen, and yet performed convincing enough to keep the film grounded in reality. It wasn’t just the main and supporting characters that made the film, the featured child actors, suicide bombers and handicapped extras contributed to the story as well. If there is any weak link, I guess it would be the existence of Fang Xinwu’s deceased drug addict girlfriend. There weren’t much scenes for her, but she failed to bring out the desperation and regret, and became a redundant pretty vase. Thank goodness for the director’s use of voice over and close-up angles on Eddie Peng to bring out the anger and regret. Double thumbs-up for the film! Operation Mekong was based on an incident that occurred in Chiang Saen District of Chiang Rai Province on 5 October 2011 when 13 Chinese crew members from two cargo ships were murdered by a Myanmar drug-trafficking ring. Bona Film Group collected large amount of information from the criminal (糯康) Naw Kham’s law suit. The China police also provided support for this film by providing information and trial footage that were never publicly revealed. The production team entered the Golden Triangle district where drug dealings are rampant to inspect and investigate. Filming of the movie took place at the Golden Triangle area, Malaysia Yunnan and Beijing. They obtain a special permit for the use of firearms, which meant that the cast and crew had to wear real bullet vest during filming. Prime Minister Prayut Chan-o-cha said that the film would be banned in Thailand if it was found to “damage” the country. Some believe that the reason for his government’s nervousness is that Thai troops, the “elite” anti-drug Pa Muang Task Force, were known to have been at the scene of the massacre. Naw Kham, a Golden Triangle drug kingpin, and his gang were found guilty of attacking the two Chinese cargo ships in collusion with Thai soldiers. He was executed in March 2013 in China along with three accomplices, including a Thai national. The Thai actor who acted as Naw Kham is Pawalit Mongkolpisit, known for his work in “The Elephant King”. He won the Best Actor award at the Thailand National Film Association in 2000 for his performance in the Pang Brother’s Thai-language thriller “Bangkok Dangerous”. Pshom (宋哥) is Vithaya Pansringarm who acted with Ryan Gosling in “Only God Forgives”. Operation Mekong marks Eddie Peng’s third collaboration with director Dante Lam after Unbeatable and To The Fore. While Zhang Hanyu often had a tough guy screen persona, he did not have much experience in the action genre. He accepted the film thinking that there will be a lot of use of special effects. He was shocked when the director require him to wear thick bulletproof vest, carrying real grenade, hold live firearms and outrun a dog. He was asked to do a fight scene while carrying nearly 20kg of equipment. Bingo is a 3-year-old drug detector Malinois breed dog. It is his first film and his action scenes are directed by world-renowned “wolf-whisperer” Andrew Simpson (The Revanant, Wolf Totem, Game of Thrones). 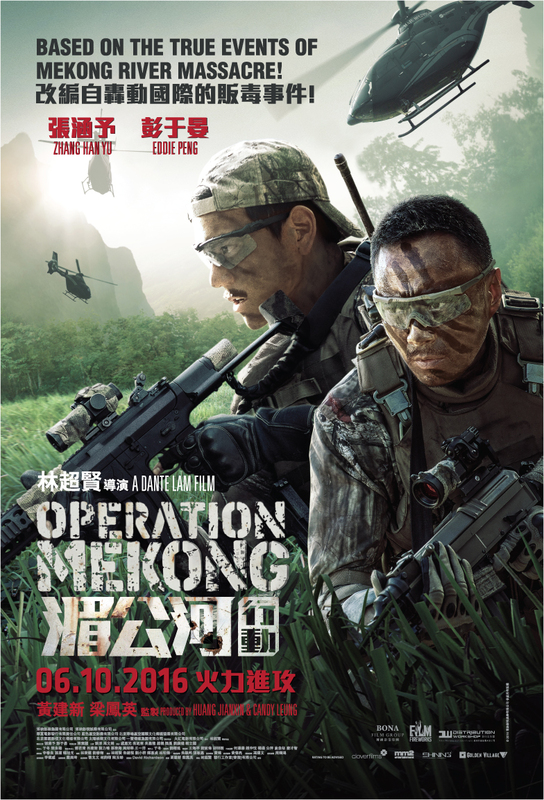 Check out Operation Mekong (湄公河行动) Official Weibo. Operation Mekong (湄公河行动) is out in cinemas on 6 October 2016. Oh, looks like a very tense movie! I will recommend this to my loved ones who loves such movie genre. Your review is a big help! Wow! Looks like it’s a great movie to watch… Lots of actions… Let’s go watch it..
Is there such thing as a wolf whisperer?? I’m thinking that’s a very cool thing! Looks like a great action movie to watch for. The realisticscene is what makes it more exciting. I haven’t heard of this event in real life so it would be interesting to learn a little bit more with this film. Glad to hear it was well paced throughout the film and not just hyped up in the middle. I will look out for it in the UK. This plot is interesting! Movies based on real life incidents generate lot of curiosity. But it’s a challenge for the director to retain the realty and blend it with the cinematic commerciality. The realness of the scenes and the fighting that doesn’t look like staged or choreographed is what makes an action movie awesome. Your review was splendid, I am now wondering how I could watch that movie. I’m reminded of the movie 33 about those trapped miners. That was my most fav movie inspired by real incidents. Let me kneck this out and find if I like this more than 33. Mekong River would really bi a nice backdrop for an action packed movie. It would be exciting to watch this one. There’s always something in an action film that always made me excited to watch. II actually like how you convey your thoughts on this movie. A very well written review! They must be giving you good remuneration for doing so good with this. Haha. Like mentioned in the disclaimer, it’s my personal opinion and not a paid one. Looks like quite the action packed movie! How true do you think it stayed to the actual incident?